1) The Ulpan has a wide range of different levels. In addition, there are conversation classes and classes for senior citizens (that take their special needs into account). 2) Assessment tests – for incoming students who already know Hebrew – are held twice a week all year round. 3) Possibility to join classes that have already started, subject to the assessment test result. This option and the variety of classes greatly shorten the waiting time for the start of studies. 4) We offer classes in the morning, afternoon and evening. 5) Studying schedule can be from two to five days a week, and from 6 to 25 hours weekly. 6) We provide social and cultural activities: celebrating Israeli holidays and memorial days; we organize tours of Tel Aviv and throughout the country. 7) We use teaching aids for learning the language such as: classrooms with wi-fi, computer room, watching news and current affairs programs, listening to songs, watching movies, excursions and more. 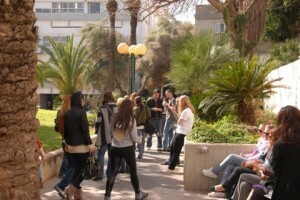 In addition, all students receive newspapers at the appropriate level. 8) We use a large variety of textbooks for different levels. 9) The teachers provide reinforcement and individual assistance for students who have difficulty according to professional criteria. 10) We offer special classes for summer studies, from 3 to 6 weeks. 11) Possibility to pay for the entire course or pay with monthly payments. 12) Possibility to freeze studies (and return within a year from the last day at Ulpan). 13) We provide excellent learning conditions, including tens of air-conditioned and spacious classrooms, an elevator, an event hall, a subsidized cafeteria, a well-kept garden, a wi-fi environment, etc.